President Trump tweeted there was a "good chance" North Korean leader Kim Jong-un would agree to denuclearize the Korean Peninsula. Based on his tweets, it seems like President Donald Trump is optimistic about his potential meeting with North Korean leader Kim Jong-un. Trump tweeted, "There is a good chance that Kim Jong Un will do what is right for his people," and said people should "look forward to" the meeting. Trump's tweets follow Kim's secretive meeting with Chinese President Xi Jinping. 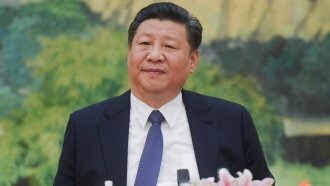 Chinese state media reports Kim told Xi he was committed to a denuclearized Korean peninsula. North Korea has called for denuclearization in the past; officials even claimed a nuke-free Korea was the "dying wish" of former North Korean leaders Kim Il-sung and Kim Jong-il. But as with pretty much everything else, the U.S. and North Korea don't see eye to eye on what denuclearization actually means. The Kim regime views its nuclear program as the ultimate safeguard from a U.S. attack — it won't give that up lightly. North Korea has previously said its denuclearization should be linked to similar disarmament by the U.S.
Kim's statement said denuclearization would come with "an atmosphere of peace and stability" on the peninsula. That could mean Kim will ask for a U.S.-North Korean peace treaty or U.S. troops to be removed in South Korea — things the U.S. has resisted agreeing to. Trump also tweeted that harsh economic sanctions on North Korea must "unfortunately" stay in full effect until he meets with Kim. The fate of those sanctions is likely to be a key part of their initial meeting.